Pardalotes are small compact little birds which eat mostly insects . Of the four species found in Australia, this Forty-spotted Pardalote is endemic to the Island of Tasmania. 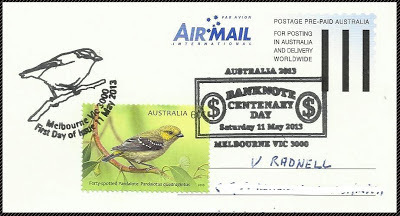 This stamps was cancelled on the first day of issue in Melbourne during the recent World Stamp Exhibition held at the historic Exhibition Building .